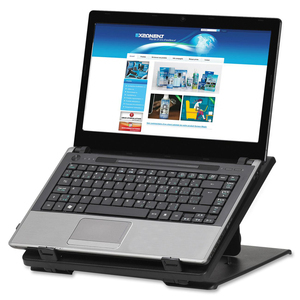 Premium Laptop Riser supports most laptops and docking stations up to 15-3/4" weighing up to 16-1/2 lb. Tilt easily adjusts up to 45 degrees for enhanced viewing comfort. Front edge brackets stabilize and hold laptop in place. Cooling vents help dissipate laptop heat. 360-degree swivel base provides user flexibility.